Constructive Group Created with Sketch. Nonprofit Brand Strategy: Breaking Through the B.S. Share Combined Shape Created with Sketch. LinkedIN Created with Sketch. Combined Shape Created with Sketch. Twitter Created with Sketch. When I tell people I work on nonprofit brand strategy, I get a lot of blank stares and raised eyebrows. I get it: brand strategy is a bit of a buzzword these days and it’s not exactly easy to define or understand. Adding to the confusion, there’s a lingering perception that brand strategy belongs exclusively to the corporate world, that it’s something mega brands like Nike, Coca Cola, and Starbucks leverage to woo new customers in a crowded marketplace. So this article is for all those interested in, confused by, or skeptical about nonprofit brand strategy. It’s my answer to the raised eyebrows, a proclamation of my firmly held conviction that a well-articulated brand strategy can be transformative for organizations working to create social change. Our team has written a lot about brand theory already, and my aim in this article is to move beyond theory and discuss some of the tangible outcomes of a successful nonprofit brand strategy. But to make sure we’re all on the same page, I’d like to quickly review what brand and brand strategy are. There are many definitions of brand, but for our purposes let me define it as the collective perception of an organization shared by its customers or constituents. Brand lives in the minds and experiences of all the different people who come into contact with an organization, including staff, board members, donors, beneficiaries, etc. As branding/design/all-around genius Marty Neumeier notes, your brand is not what you say it is, it’s what they say it is. Brand strategy is an organization’s articulation of how its brand is meant to be understood and expressed. At Constructive, we break down brand strategy into the ideas that drive and position an organization, the messages that express them, and the designed experiences that translate these ideas into more tangible deliverables such as a visual identity, communications collateral, and digital presence. So with that out of the way, how does a successfully defined brand strategy actually help social change organizations accomplish their mission? In my opinion, some of the greatest benefits to be gained from a brand strategy engagement come from the process itself, not only from the final deliverables. Nonprofit brand strategy engagements typically (and always should) begin with extensive research and analysis of the organization and its existing brand. At Constructive, this phase is known as “discovery,” and our research can take the form of interviews with internal and external audiences, surveys, peer analyses, and workshops with organizational leadership and staff. The culmination of this phase is a brand assessment that articulates the organizational goals for the brand strategy engagement, the perceived weaknesses and strengths of the organization’s current brand, and a plan for mitigating challenges and leveraging opportunities. "But before you spend valuable time adding painstaking detail to your RFP, remember that you want to leave room for good ideas that aren't necessarily your own to flourish." Regardless of the exact nature of this up-front research and assessment phase, the value-add is the same: invaluable insights on how people — from junior staff to leadership, donors to beneficiaries — perceive your brand. It’s a rare opportunity to gain visibility into how all these audiences think about and value your work. These perspectives can be incorporated into organizational strategy as well as brand strategy, helping organizations address internal challenges that emerge down the road or adjust their priorities based on audience feedback. For what it’s worth, I’ve never worked on a nonprofit brand strategy engagement that didn’t illuminate organizational challenges and help inform leadership’s response to those challenges. At Constructive, we often say brand strategy should be built from the ground up and embraced from the top down. Why? Because brands that reflect the ideas and perspectives of only a few at the top of the organization and/or a small team of consultants are far less likely to resonate with a wider audience — including the staff and volunteers responsible for sustaining most nonprofit organizations. Hey, nonprofits-that-have-messaging-and/or-visual-branding-that-either-has-never-resonated-or-no-longer resonates-with-staff, I’m speaking to you! You know what you also have? Staff who might feel demoralized and disconnected from the organization. Staff usually bear the burden of an outdated or dysfunctional brand because they’re the ones tasked with developing bespoke communications material from scratch or visual workarounds to overcome the fact that the organization’s brand is no longer an asset but an affliction. And that, understandably, can lead to frustration, resentment, and reduced productivity. For external audiences, outdated visual branding is always a turn-off, especially given the level of visual sophistication that most of us, in the age of Behance and Instagram, have come to expect. By the same token, if a nonprofit’s messaging no longer accurately reflects the work it is doing, its audiences are going to be confused. And who needs that? Because it’s built on the perspectives of many, not just a few, a well-executed brand strategy engagement ensures that a nonprofit’s brand resonates with both internal and external audiences. And by understanding what motivates staff to do the work, donors to donate, and partners to engage, an organization will find itself in a much better position to communicate these key ideas in its messaging and designed experiences, transforming its brand into one of its greatest resources. Many of our clients come to us for help because their external audiences seem to struggle to understand what they do and why it matters. They know that a well-articulated brand strategy can provide clarity to folks outside an organization, helping them understand the change an organization is seeking to create, how it plans to accomplish its goal(s), and how they can engage with the organization to bring about that change. It almost goes without saying that the more clarity a nonprofit can provide its audiences, the better positioned it will be to capture their attention, change their hearts and minds, and galvanize them to act. That said, a related benefit of brand strategy that’s often overlooked is the clarity of purpose it provides internal stakeholders. Having worked in nonprofit leadership, I’ve seen first-hand the disparate ideas floating around about brand values/roles/personality/logos/etc. Board meetings that touched on brand issues were a particular pleasure. (Not.) Now that I’ve switched to consulting, it never surprises me when nonprofit staff, leaders, and board members offer different versions of their organization’s vision and goals, not to mention the path forward for achieving them. It’s understandable — the business of change is complex, and lots of nonprofits go at it through different programs, services, and initiatives. It’s sort of like the parable of the blind men and the elephant, with each person describing that part of an organization’s work with which they are most familiar. Again, one of the most transformative benefits of a successful brand strategy engagement is that the process, when executed well, brings together a range of unique perspectives that, in their totality, articulate the shared ideas that drive the organization’s programs and motivate its people. 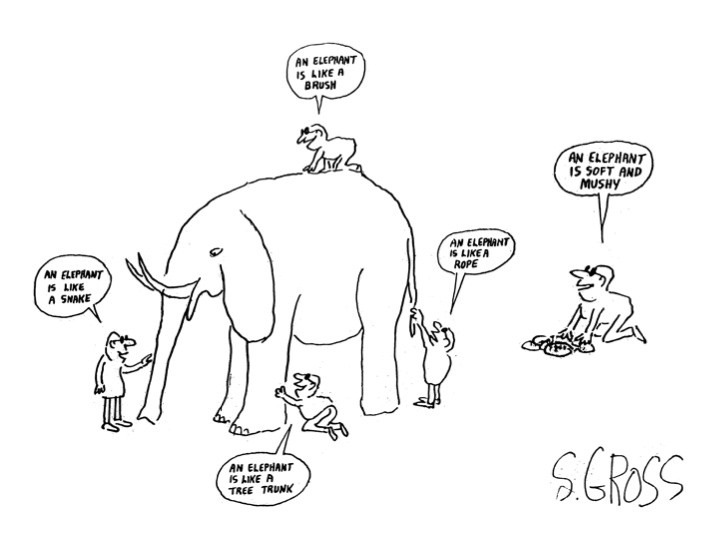 When staff, leadership, and board members feel that their perspectives have been heard, and their ideas (and concerns) are reflected in a vision and brand narrative that captures that totality, they are better able to understand how their specific piece of the puzzle fits into the bigger picture (or, to continue the analogy; how each elephant part is attached to the others). That kind of unity and shared understanding can be enormously valuable for organizations used to struggling with programmatic silos, miscommunications, duplicated effort, and staff frustration and burnout. We’ve all heard the phrase “that’s not on brand,” an expression that inspires eye rolls from even committed brand enthusiasts. But if nonprofits hope to convey consistency and build trust, they need to be able to assess what does (and doesn’t) fit their brand. Here, too, an effective brand strategy can provide a much-needed framework. Consistency is key to building trust with audiences. Humans tend not to like surprises and feel most comfortable when they know what to expect from others. We tend to like—and trust—people who are dependable (even if they’re dependably flaky), and whose responses in a range of situations are more or less predictable. The same applies for brands — to build trust with your audiences, you want them to feel confident about what they can expect from you. This idea is especially important in a nonprofit context, as organizations routinely ask supporters and potential supporters to put a great deal of faith in them: they ask us to give them our attention over many other worthy causes, ask to be trusted as thought leaders, and ask for our hard-earned dollars. But every time someone perceives an inconsistency in a nonprofit’s brand — maybe they notice different versions of a logo on a website, or come across different versions of a mission statement in collateral, or land on a donation page that doesn’t work properly — it undermines their confidence and trust in an organization. That’s why nonprofits need to take the idea of projecting consistency seriously. It’s not just the job of a communications manager to make sure the team is using the correct logo. You need a brand strategy that articulates a coherent messaging framework and provides internal stakeholders with everything they might need in the way of brand guidelines to convince your supporters and potential supporters that yours is a consistent, dependable organization. Let’s be real: the most brilliant nonprofit brand strategy will not boost an organization’s impact by itself. No, the value of an effective brand strategy lies in its usefulness to the real heroes of the show — the people who do the work. People—committed, talented staff who bring their expertise to the hard work of creating positive change—are the most important assets a nonprofit possesses. And, in most cases, their job shouldn’t require them to think about the organization’s brand; their job is to create impact. By providing them with consistent brand messaging, compelling collateral, and a clear set of brand guidelines, brand strategy can be an invaluable tool that supports and amplifies their work. So when people ask me what nonprofit brand strategy is good for, I tell them this: brand strategy is a sort of North Star that helps inform an organization’s strategies and ensures that its talented staff arrive safely at their destination. By articulating messaging and brand experiences that express shared ideas, it helps organizations communicate with clarity and consistency to their audiences, and, in turn, helps audiences better understand a nonprofit’s vision and how they can engage with it to advance a good cause. And the end result of all that? Greater impact. So there. This Insight was originally published on the Philanthropy News Digest. 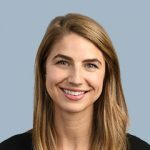 Lexie brings a depth of experience and perspective on the social change sector from years of working in nonprofit organizations on communications, marketing, and fundraising. As Director of Strategy, Lexie helps clients focus their mission and message, and deepen audience engagement—leading brand and digital strategy, conducting research and workshops, developing strategic positioning, and crafting messaging. Prior to joining Constructive, Lexie worked in political and public health advocacy in Virginia, in clinical research at Memorial Sloan-Kettering Cancer Center, and served as the Executive Officer of the Gastrointestinal Cancer Institute of New Zealand, where she was responsible for strategic partnerships, development, and communications strategy. Lexie earned her BA in history at the University of Virginia. Monthly ideas, events, and insights to help you increase social impact. Have a brand problem that needs solving? We’d love to hear about it!